school a small piece of banana. They immediately started feeding. I was a little surprised to see that. I have noticed them feeding on decomposing plants (Hydrocotyle umbellata) in the past but was unsure about banana. Its seems like a healthy snack but was very messy. (I did a water change after feeding) Thought somebody may want to know. Thanks for the great site. I have a 20g tank with 4 Swordtails and 4 Green Cory Catfish. I'm feeding them micro wafers that float for a bit and then sink, so the Swordtails knock the wafers down to the catfish. In addition, I'm feeding the catfish Sera Vipachips that sink to the bottom. Problem is, the Swordtails also really like the Vipachips, and it ends up being a battle between the Swordtails and the catfish -- of course, the Swordtails end up eating most of it. Can you maybe suggest a way I can ensure that only the catfish get the Vipachips? <Easy, this one. Feed the catfish at night! When the lights are out, provide sufficient food for your Corydoras. Do this 3-4 times per week, and you should find they're just fine. 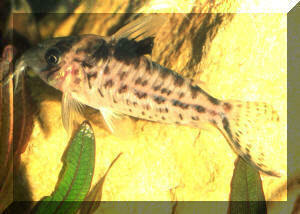 Corydoras are nocturnal by nature, despite being day-active in aquaria, and happily feed at night. And no, they won't hide away during the day just because they're being fed at night. Do also remember to keep the tank quite cool, 22-24 C is ideal for both Swordtails and Corydoras aeneus, otherwise their metabolism will be much higher than it needs to be, and that'll place extra demands on their diet as well as shortening their lifespan. Hope all is going well for you. I have a question on feeding please. The only 2 types of fish I have in my 75 gallon FW aquarium are Corys and angels and I feed them both about an hour before the lights go out. I usually start feeding the angels first on one side of the tank. I feed them small amounts for about 2 minutes at a time trying to keep any of it from going to the bottom. When they get engrossed in eating I try to secretly put the Corys food in the opposite side. But usually the Corys do no come out right away to eat, and many times the angels come over and start eating their food after they have finished their own. Because of this I always put extra food for the Corys. The next morning all of the food is gone off the sand bottom. I cannot always tell how much of the Corys food the angels are getting so I am concerned about the Corys getting enough. Do you have any thoughts on this please. I had thought about doing that, but have read that despite the fact that many types of catfish are nocturnal the Cory is not. Will they still eat at night? Thanks Neale, will the food for the Corys at night be less noticeable for the angels? Do they move around much and look for food at night? Thanks Neale, I love them. I think they are great little guys and wouldn't have a tank without them. Thanks again for all your help. Hello Crew, Hope you are having a great day!! I have some questions on feeding please. I currently have 6 panda Corys and plan on buying some yoyo loaches and a Bristlenose catfish. <Wouldn't keep Botia almorhae with Corydoras panda; the differences in size, aggression at feeding time, and social behaviour are just too acute. First, I want to know if they will all get along or if the loaches will bother the Corys. Also, when it comes to feeding how is that done since they all eat mostly food off the bottom. Should I put their food in separate places in the tank, or will it be OK to feed them all together? I am worried about the loaches maybe picking on the Corys during feeding time. and some are wafers. Both of the packages suggest to feed enough for the Corys to eat within several minutes. My Corys don't eat all at once. They may eat a while then swim around and come back later, etc. I am at a loss to feed them the proper amount without depriving them or overfeeding them. If you could make a suggestion I would really appreciate it. Also, should they be fed every day? Thank you for your help. Thanks for your advice. Please tell me the proper way to feed the Corys along with other fish when I add them. I plan on getting 6 angels and I have heard that they are very aggressive eaters. How can I feed them and at the same time keep them from getting the Corys food as well? Thank you again. Thank you Merritt, later I plan on adding about 6 angels. I know they will eat a different food, but how can I prevent them from eating the Cory's food? Feed them both at the same in different parts of the tank? Thank you again.